Zeiss binoculars appeal to many outdoor enthusiasts, from hunters and bird watchers to hikers and campers. Renowned for their German manufacturing and durability, they are an investment at the higher end of the price scale, but one many people find worthwhile. Zeiss, the German manufacturer, has been in business since 1894. Their design of binoculars like we use today were invented 100 years ago, when the company combined two monocular telescopes. Throughout the years, Zeiss has made many technological advances, including using telescope lenses in their consumer products since 1954. In 1969 they introduced pocket binoculars and in 1990 they released models with vastly improved image stabilisation. Zeiss’ innovation has continued into the 2000s. In 2004 they introduced fluoride in lenses for reduced colour aberration, and in 2012 their Victory line boasted more than 95% light transmission. Today, Zeiss is a massive corporation with more than six separate business groups that develop and produce quality optical systems for different markets. They make everything from industrial measuring technology to top rated binoculars for outdoor enthusiasts. Zeiss’ offices are located in Oberkochen, Germany, with subsidiary companies in Aalen and Munich. The Vision Care and Consumer Optics Department is the arm of the company consumer binoculars fall under. Zeiss’ current offering includes the Victory, Conquest and Terra lines as well as several models of specialist binoculars. They also make laser rangefinders, rifle scopes (like the Zeiss Conquest MC), monoculars and a variety of related accessories. The Victory line of binoculars is cutting edge – simply the best that Zeiss offers. They guarantee excellent performance and clear, correct imagery for all nature moments, from hunting and bird watching to hiking and general travel. The line also includes high-end laser range finders. Next are Zeiss Conquest binoculars. Known as their benchmark line, they’re higher end yet cost effective binoculars that offer great performance for serious nature observation. Conquest binoculars are also available in a range of different magnifications and diameters for various purposes. For those who’d like to own a pair of Zeiss binoculars but can’t afford to invest in the higher end Victory and Conquest lines, the company also offers their Terra models. Good quality entry-class optics, they are compact and useful for hobbyists, travelers and outdoor enthusiasts who are looking to save a bit of money. 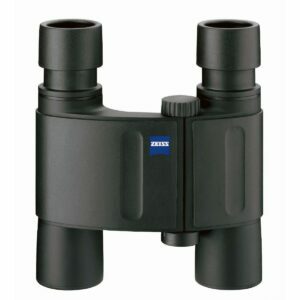 Zeiss also offers three highly specialised models of binoculars for specific purposes. One pair, the Dialyt, is specifically made for hunting and outdoor activities at night. Another pair, the Marine, is rugged and durable for water sports enthusiasts who might get into some splash-worthy situations. And the obscurely named 20×60 T*S model has both night vision and shake free image stabilisation. As well as their lines of binoculars, monoculars and scopes, Zeiss also makes related accessories. They include products for lens care, comfort straps, mono boosters and adapters, binocular tripod adapters and stands for shake-free imagery. While Zeiss company headquarters remain in Germany, as well as their subsidiary companies, only their top of the line products are made there. Zeiss’ entry-level products are all manufactured in China under strict quality control. Of course, many people will point out that other brands manufacture binoculars with the same technological advances that may cost less, but others will make the argument that it’s still hard to beat Zeiss for innovation and overall longevity. It’s true, whether you’re a fan of the brand or not, they have made their mark over the years and have to be admired for their continual innovation and staying power. When Zeiss started manufacturing binoculars, the competition was virtually non-existent. While today they’re in a much tighter market, they still remain the favourite of many bird watchers, hunters and folks who love exploring the outdoors.